Atomic Lizard Ranch is one of the oldest bearded dragon breeders in the United States. View our colorful, high-quality dragons for sale! Thank you for all your help! Our beautiful Gala Red beardie arrived at 10:30 this morning and he’s doing great! He has already eaten some Reptiworms and collard greens and calcium. He has also been exploring his new habitat and basking on his rock. He is very alert, healthy, and curious. His colors are striking and very vibrant. Thank you so much for raising such a nice bearded dragon! We’re so glad to have him. First off I cant express how much speaking with you eased my mind about trying to raise another dragon. With the knowledge you have passed on to me. I believe I can give him a proper happy home. Thank you so much. Just received him early in the morning! He is wonderful like you said,very friendly and definitely a great eater! Thanks again Collette for a great dragon. I’ll update you with pictures as he gets bigger. Welcome to Atomic Lizard Ranch! Here at Atomic Lizard Ranch, we’ve been making a life out of caring for and raising bearded dragons since 1991. Over the years, we’ve only become more enamored with these wonderful creatures. We even went so far as to originate two unique morphs, the Red Gala Phase in the year 2011 and in 1998 the Citrus phase. From the beginning of our work with Bearded Dragons, we’ve become sustainably minded and are largely a self-sufficient operation. The topography of our Arizona home and of course our facility is quite like the bearded dragon’s natural habitat, making it an ideal place to raise dragons. Years of caring for them have given us the knowledge we need to make them as comfortable and healthy as possible and to also pass along our knowledge to people who want an intelligent and bonding pet. We always make sure that the people who have purchased our Bearded Dragons have all the necessary information for safe housing along with care. When it comes to the bearded dragons we have for sale; health and comfort are our paramount concerns. That’s why our bearded dragons not only look great, but are happy, energetic, and well-tempered creatures. The question you have to ask yourself is, are you a bearded dragon devotee or just someone on the fence about them? 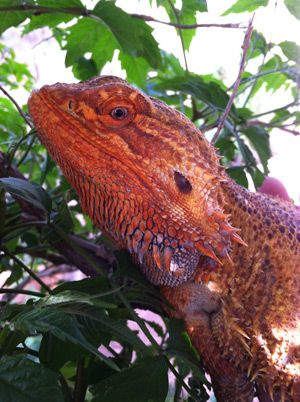 If you are interested in bearded dragons, come and find out why we are Arizona’s premiere bearded dragon breeders. One of, if not, the oldest professional Bearded Dragon Breeders in the United States. How do we see the babies that are still not sold? I cannot seem to locate them on here. I was wondering if you have any fire red female adult bearded dragons? Hi Bradley, I sent the quote to ur email. i live in canada and was wondering if you know a good place i could buy a beardie. im looking for a 2-4 year old thats tame and good with kids. So sorry we do not ship out of country. Yes we do on and off please check our available pages weekly. Looking for an orange colored dragon. The one posted is beautiful. I had one and she was stolen from me. That will never happen again. I have had several dragons over the years and they are the best. The dogs stay away from them. It can be a male or female, no preference, have had both. The web sight is up to date. I bought a hypo melanistic bearded dragon from here 4 months ago and he is super healthy and active. He loves his greens and his bugs and has not had any problems. Recently took him for a check up. Highly recommend buying here! I hear that a lot! Do you ever offer retired males? I’m only in the research stage in owning a dragon. I’m not an impulsive kind of person. Everything I’ve read, so far, recommends an adult for beginners. I like the idea that you would choose one that fits what I’d be hoping for. Yes we do, females as well. Hi, I have wanted a bearded dragon for a long time now and I was wondering if you knew when you would possibly have more leather backs in stock, and if you possibly knew what phases they could be. I have surfed your website over a thousand times and I hope to purchase a bearded dragon from you!???????????? They would be red, tangerine and orange possibly some hypo’s in about 6 weeks. Thank you Colette for being so professional. We appreciate how kind you were when we changed our mind about purchasing a dragon. It was a delight to do business with you, and I would be happy to recommend you in the future. Thank you again for taking care of this customer. Check us out when your ready. Oh how neet I am interested in another dragon I currently have 1 but would like to get a few more I’ve never had a better pet mine thinks its human lol. do you have any visual padarox, zeros, or purple/blue dragons?